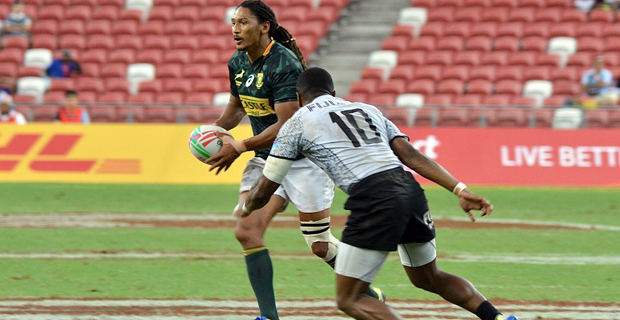 The Fiji Airways Men’s National 7s Team hopes to retain their title in the Singapore 7s has been shattered after South Africa beat them 20‑19 in the final. 😮 WHAT A COMEBACK BY THE BLITZBOKS! South Africa came back from 19 points down to beat Fiji 20-19 and claim the #Singapore7s title! Fiji dominated in attack and defense in the first half however, South Africa made a strong come back in the second half to claim the title. It was Fiji’s Aminiasi Tuimaba who raced away from the South African defence in the second minute to score the first try of the match. Fiji continued applying pressure to South Africa which later saw Napolioni Ratu and Viliomoni Botitu flying over the try line for a try each to extend Fiji’s lead 19‑0 at halftime. Both sides started the second half with poor handling. South Africa then started to apply pressure scoring their three tries before Selvyn Davids kicked the most important penalty of the tournament to seal them the win. Fiji remain in second place on the World Sevens Series standings with 142 points, USA continues to lead with 145 points, New Zealand remain in third place with 130 points while South Africa currently has 121 points in fourth place. In other results, England settled for bronze after defeating USA 28‑7, while Samoa finished fifth after defeating New Zealand 19‑17.